This is genuine CPU fan !!! not generic or aftermarket imitations. Note: Heatsink is not included and there are 2 mounting holes only. A malfunctioning cooling system can cause your computer to overheat, The laptop starts beeping, freezes, restarts by itself or shuts down after it has been on for some time, typically 10-15 minutes or more. If you start it again, it does the same thing after just a few minutes. Slow down or shut off by itself in extreme cases, it can even damage your CPU, video chip or motherboard. 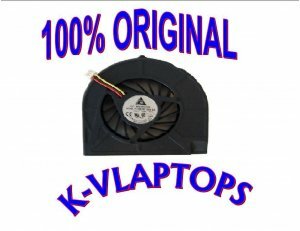 Replace your worn out or noisy fan (thermal module) with this brand new genuine part!